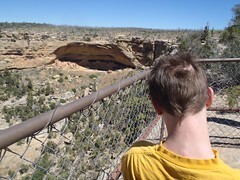 The Wethermill Mesa Tram Loop was our favorite part of Mesa Verde National Park. There were very few tourists just doing the loop first thing in the morning. 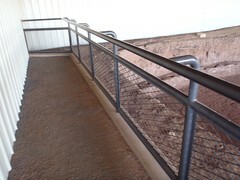 Most of the visitors were here to do the tours down to the cliff dwellings, which is not accessible as it involves steps. 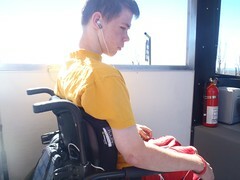 The tram, however, is wheelchair accessible and is very well worth taking to the various stops. 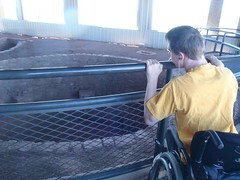 The front row of seats is removed for the wheelchair to fit. The tram has a pull out ramp to roll up and on. Overall very easy and accessible. One big issue, though, is no tie downs. It did not seem to be an issue, as the tram does not go very fast, however coming back up to the parking lot the turns caused Mik to end up moving around facing sideways. Of course, that freaked Mik out just as he was finally relaxed after his initial freak out of realizing they did not use any sort of tie downs. You could just ride the tram loop and never get off, but then you really would not see much of anything. 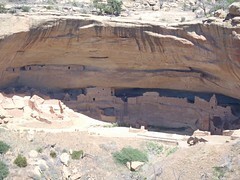 The first stop drops you off at the Badger House Community trail that takes you to several different archeological sites. This is a paved trail that is actually quite level throughout. 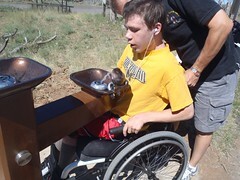 Mik even liked that the water fountain at the start was low enough he could roll up to and drink from. Along the Badge House Community trail there are several different sites that have been excavated. The sites are mostly covered pavilions with the paths being easy to navigate through. 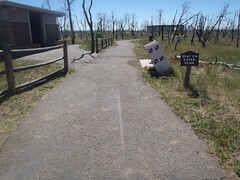 However, on the first one the path goes straight back and it is a somewhat tight squeeze to turn around to go back out. For the most part Mik found it easy to get up close to the fencing and see the sites. 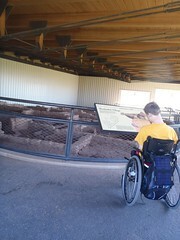 He also enjoyed the signage at the sites with further info and layout diagrams. After going through the whole trail, we waited for the next tram. On the way back to the parking lot the tram makes two quick stops at overlook trails. 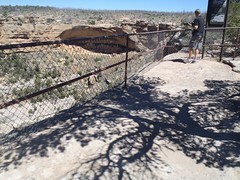 These are short trails down to overlooks that give you a good view of cliff dwellings. 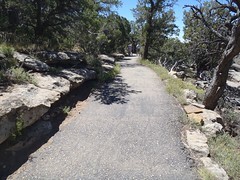 The trails are mostly paved, but they are quite steep. 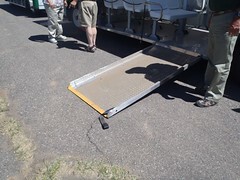 Since they are short, they are not too bad to do, but it certainly takes much more effort to control the wheelchair slowly down and then pushing it back up than just walking the trail. Also, at the bottom of one it was rocky and uneven in the lookout area. Overall the tram ride was very worthwhile. The accessibility is good other than they really could use tie downs. 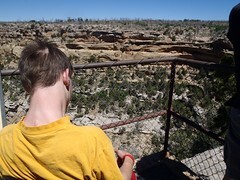 The driver was also very friendly and it was surprising to learn that they average only 2 wheelchair visitors a season, especially considering it is really the easiest accessible way to get up close to some ruins at Mesa Verde National Park.